An LA family with serious boundary issues have their past and future unravel when a dramatic admission causes everyone's secrets to spill out. 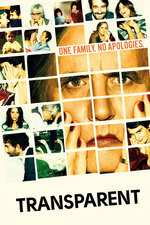 Starring Jeffrey Tambor, Judith Light, Amy Landecker, Jay Duplass, and Gaby Hoffmann. Oh, good. I was going to post a Talk about this because I want to follow it but I'm not sure I'm the best person to post about it -- I have very little identification with the genderqueer side of things and mainly I'm grooving on the acting and writing. The creator is Jill Soloway, a veteran of Six Feet Under and other shows, who had a similar experience with her own father coming out as transgender. (This is barely a spoiler. The show isn't about plot or drama but emotions and relationships.) Tambor is simply amazing, taking on the role of a lifetime with an emotional depth you probably didn't expect if you know him as Hank or George. He's done a lot of prep work with TG advisors, some of whom I believe are shown in the group session. He and Hoffman also have some really great chemistry, portraying an intimacy and emotional compatibility that is very convincing. Landecker is also terrific, breaking out of her soccer mom persona (e.g. from Enough Said) by playing a soccer mom who is literally breaking out of her persona. Duplass I don't know (I know his brother though), but all three of Tambor's "kids" are great at showing a family with history and in-jokes and running quirks that drive each other a bit crazy. (It's also being touted as a superior depiction of Jewish life in California.) You also probably won't believe how good Judith Light is portraying the mother. But really, this show's bar is set by Tambor and Hoffman, who is fearless, as some of her other work will tell you. I'm not sure where to put this comment (and can't find the relevant info anywhere), so my apologies if inappropriate here… Am I responsible for creating the other episode threads, since I kicked this pilot thread off? I just finished the entire season, so I don't want to spoil anything. But I loved it. The pilot is a very good introduction to the season. Nope, but if you (or anyone else) wanted to post the remaining 9 episodes at once, I think there would be general support for the idea, given that's what mathowie did with Orange is the New Black, more or less (Season 2 Episodes 1-6 were up in a scatter-shot pattern, and then Matt posted 7-13 at once). I liked the pilot. The acting was good. The dialog was convincing. The cast has good chemistry with each other and resonates as family. I'm a little worried about the actual plot. The infidelity, selfish kids, coming out story didn't spark for me as super compelling. I mean, it's great if we end up getting a compelling trans woman character out of this show but just in terms of plot arc, I wonder what they're going to do with it. I've wanted to finish making the posts, but I haven't had time to watch all of the episodes yet and so don't want to read the summaries, no matter how vague they might be. If somebody else wants to make the posts, that'd be great! We just finished episode 8. in 7 and 8 there were some things I was taken with, in particular the use of a particular Dylan song at intro and credits in 8. The introduction of subjective in-camera for Ally's segments is cool. I'm struck by how much older than her character the actress playing her is and wonder if that's a deliberate choice. Whatever, I'm cool with it. Josh seems like a pop-lit stock character, the oversexed nebbish, from Roth and Allen and even Junot Diaz, that I have to say fails to hook me in all his incarnations, possibly the character's point in all his incarnations. I think maybe the show is going to be difficult to talk about, not least because of the all-at-once presentation. I just binge watched the whole series. I hate ALL the characters (except maybe the security guards) but every time I stopped watching I spent the next few hours wondering what happened next. On a more meta level, what is the deal with watching endlessly unlikeable, narcissistic people interact? There are dozens of movies featuring this dynamic. Did it start with Woody Allen or were there people doing it before him? I thought it was an east coast thing, but this show is in LA. Is anyone else still watching this? I just started and am a few episodes in. Should I put up posts for all the other episodes? are there more episodes past the first season? or do you mean more of the episodes of the first season? Due to binge watching, all the episodes are blurred into one big one in my brain. I meant the rest of the first season. I checked with Matt and put them up and he consolidated them. Thanks, Jacqueline. I'd been meaning to do that for ages, but been too busy.